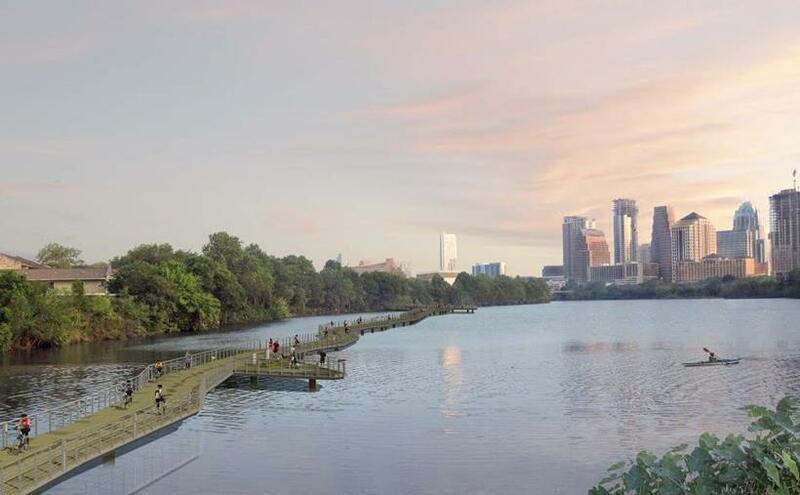 Project Spotlight | The Boardwalk Trail at Lady Bird Lake written by Beth Sims, dwg. The Austin Chapter of the Society for Marketing Professional Services focuses on the needs of marketers and business developers in the architectural, engineering and construction community, along with related strategic partners. "To advocate for, educate and connect leaders in the building industry." Beginning in our next newsletter we will be featuring advice from Industry Experts, but we want you to pick the topics. Need some career advice? Wondering how others have handled a situation? Got a question for an industry pro? Our volunteers are glad to help. Confidentiality will be respected. Please send your questions to Cara Lyons, and look for the answers in next quarter's newsletter! It's not too late to register for Southern Regional Conference! SMPS Austin's Job Bank currently has a variety of opportunities in our industry. For more information, please see our website. SMPS Austin advertises job openings free for members. There is a $100 fee for non-members. For more information, please contact Cara Lyons. Join the SMPS Austin Chapter LinkedIn Group and get connected to our members! Follow @SMPSAustin to stay informed about industry-related news and events! Read SMPS Austin's blog, The Network, for everything from helpful tips and resources to upcoming events and special announcements! 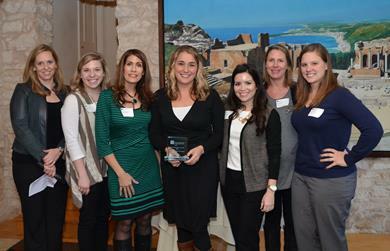 Check out photos from all of the SMPS Austin events on our Picassa Web Album. Just like that – a new year has begun! Personally, I cherish this time of year because my mind is clear and it is so much easier to see the big picture. Seize this opportunity, my friends - because all too soon we'll be chin-deep in proposals, meetings, and projects. 3. 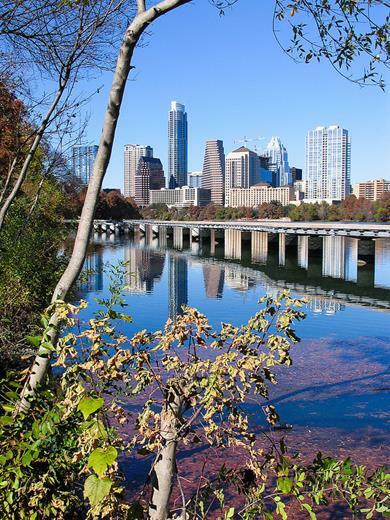 Offer better access to information about SMPS Austin through a redesigned website. This year, one important way we are raising the bar is through a partnership with the UT Austin McCombs School of Business Executive Education Program. The University came on board as our Education Sponsor late last year, and we have now begun to incorporate them into our programming and member initiatives. We were delighted to have Dr. Gaylen Paulson, Associate Dean and Director of Texas Executive Education present at our annual Fall Mix & Learn. His session on "The Art and Science of Effective Negotiation Skills" was a huge success! We are equally thrilled to have the University headlining at our upcoming May Workshop - so stay tuned for more information. Members, listen up! Starting in January, each time you preregister and prepay for an SMPS Austin event, you are entered to win a free seat voucher in one of the University’s Two-Day Open Enrollment Courses – a $2,500 value! The more events you attend, the better your odds of winning. 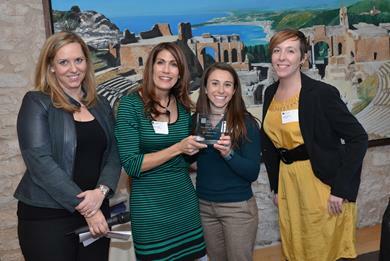 The drawing will be held in May, so we hope to see you at many SMPS Austin events leading up to then! As a volunteer organization dedicated to the A/E/C Industry, SMPS Austin is in an excellent position to help our members grow and thrive in their professional roles. Serving on a committee continues to be a very effective path to professional development, so we definitely encourage you to get involved! This year, we have also begun offering members the chance to showcase their expertise though speaking and writing engagements. Opportunities exist for members to participate as conversation leaders at our Lunch & Learn Roundtables and as contributing writers for our Blog, Quarterly Newsletters, and LinkedIn Group. 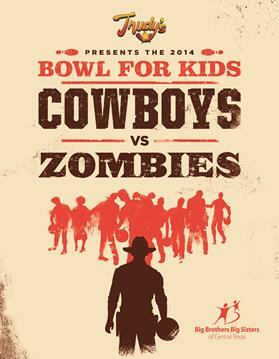 If you are interested, please don't hesitate to contact an SMPS Austin Board Member. This year we also continued our annual Communications Awards Program, which honors the creative achievements of A/E/C firms (be sure to check out our winners further down in this newsletter!). Additionally, we have plans to conduct a local market salary survey, with data made available for free to SMPS Austin members. Our CPSM Study Group is kicking off this month, and also be on the lookout for more information on our annual Mentor Protégé Program soon! We envision a website that is simple, informative, and easily updated. But if you have been through the website redesign process before, you know it can be time consuming and expensive. As a 100% volunteer-run, non-profit chapter, we struggle with these challenges, too - but we are also lucky to have a huge network of very talented folks around us. Members: if you are interested in contributing to our website redesign process, contact Cara Lyons, Communications Director. So in the spirit of the New Year, as you are pondering the big picture for yourself or for your firm, I encourage you to consider all of the programs, tools, and relationships that SMPS Austin has to offer. Whether you are interested in developing new business for your firm, advancing in your career, or simply learning something new - we are working hard to help you achieve those goals. 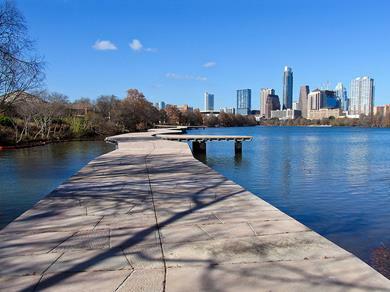 The much awaited boardwalk trail at Lady Bird Lake is estimated to be complete in June of this year. Due to many issues, including private property holdings and topography, there has historically been a 1.1 mile gap in the Trail at Lady Bird Lake. Along this gap, users must divert onto the narrow sidewalk, and travel along busy Riverside Drive, crossing I-35 business entrances and creating other points of conflict. The boardwalk seeks to fill this gap, and will result in a safe, continuous, ADA-compliant pedestrian and bicycle trail with unprecedented access to Lady Bird Lake. Completing this section of lakefront trail will better link communities on the city's eastside to downtown. The design was developed after a throrough investment study conducted by The Trail Foundation and a public involvement process conducted by The City of Austin. 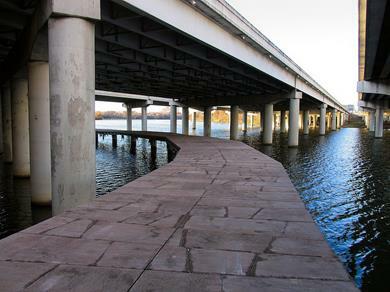 The Boardwalk Trail is an approximately 7,200 linear foot section, stretching from the current trail end by the Austin American Statesman building to International Shores (Lakeshore Park). The trail is 10 feet wide, with a 2 foot shoulder on each side, making a 14 foot total width for the bridge sections. This width should accommodate two users abreast in both directions with room in between for passing. Several rest areas are also provided off of the main trail to allow users to stop out of the traffic flow. The structure and guardrails are made of galvanized steel spanning 36” concrete piers, 20' on center. The deck is built from a series of 30” wide prefabricated, colored and textured concrete planks. The guardrails include continuous LED lighting for evening and nighttime usage as well as amber navigation lights to warn boaters of the structure. The Boardwalk Trail follows many sustainable design criteria, including the use of local and recycled material, construction waste control and efficient lighting. Additionally, the galvanized steel used for the elevated structure and guardail contains recycled content and has a long, useful life. The design doesn't require any paint, which avoids VOCs and the potential for solvents to spill into the river. The boardwalk route is almost totally within the flood plain which necessitates unique structural and electrical solutions. The majority of the trail is built on piers in the lake, where it is difficult to accurately estimate the bearing depth. The trail over land was often in deeply wooded areas that required extensive surveying, special environmental protection and conservative designs for unknown conditions. Land access to the site is very limited; accordingly the vast majority of the work has been supplied over water throughout construction. These land areas are mostly in protected wetlands, requiring special environmental protection and restoration techniques. This project is the result of a public private partnership. 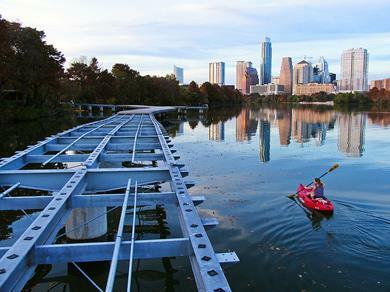 The City of Austin provided the funding for design and permitting for the boardwalk, totalling over $1.9M. The citizens of Austin approved construction funding under the 2010 Mobility Bonds, and an additional $3M was contributed by the Trail Foundation. The City of Austin will provide maintainence for the Boardwalk Trail. Have you ever wondered why some individuals seem to have more influence than others? Do you even realize when you are being influenced versus influencing others? When I was asked recently to be on a panel of individuals considered to be influential leaders, I thought about what makes a person influential. Like any good marketer, I did my research to prepare myself for this panel discussion. What I found was fascinating. There are many books on the topic of influence. One particular book I found interesting is Influence: Science and Practice by Robert B. Cialdini. This author has written several books regarding influence and teaches courses on how to become a certified influencer. Wouldn’t you agree that as marketers we are constantly trying to influence clients to use the services our firms provide? Our tools of influence might be social media, proposals, presentations and web sites, but the most important tool is the person. Every facet of marketing can be directly linked to influence. So, how can you hone your influencing skills? Through my research I found the most common attributes of successful influencers. What is the best way to build credibility? Trust + Expertise = Credibility. First and foremost, you must be trust worthy. It does not matter how much you know if people do not trust you. Gaining and keeping trust is not easy. Trust is earned by putting aside your self interests, being honest (especially about mistakes you have made) and keeping confidential information confidential. Second, your expertise must be demonstrated. Most experts typically establish authority through their education. One can also demonstrate expertise by writing articles, giving presentations and appearing on panels. Third party endorsements are essential when it comes to demonstrating expertise. People willing to better themselves and share their knowledge with others are seen as experts. To read the full article visit our blog, The Network. 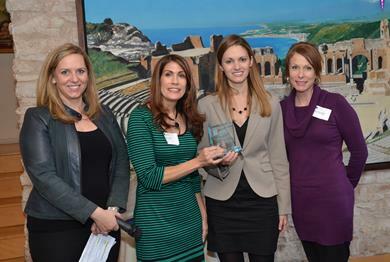 Congratulations to our 2013 SMPS Austin Communication Award winners! 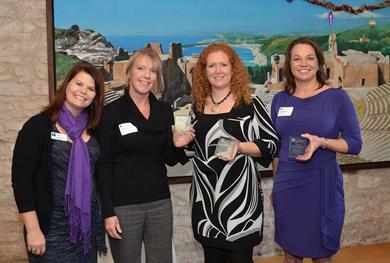 This was the fourth annual event for the Austin Chapter, and we had outstanding entries in all categories. 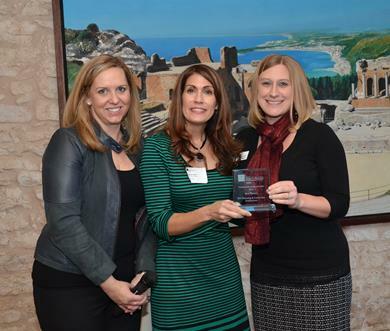 The awards presentation took place during our December Networking Luncheon on December 10th at Carmelo’s Restaurant in downtown Austin. The winners are pictured below. Finally, a special shout out to Deborah Black with Hamilton Associates, and the programs committee for volunteering to coordinate this year's comeptition. This event wouldn't have been possible without our dedicated volunteers. Thank you and congratulations to all our winners! Lauren Gammon has recently started at Coleman and Associates as the firm's Office & Marketing Director. Coleman and Associates is a landscape architecture firm that produces outstanding landscapes across Texas and beyond. Gammon was born and raised in Austin, Texas (yes, they do exist!) and is a second generation Longhorn, having graduated from the University of Texas at Austin. In her time outside of the office, Gammon plays bass guitar alongside singer-songwriter Cheryl Murdock. She writes an Austin music blog and hosts a classic rock podcast. She also enjoys spending time with her awesome corgi, Preston. Gammon is looking forward to getting more involved in the A/E/C community through SMPS and hopes to build solid relationships between Coleman and Associates and other firms. 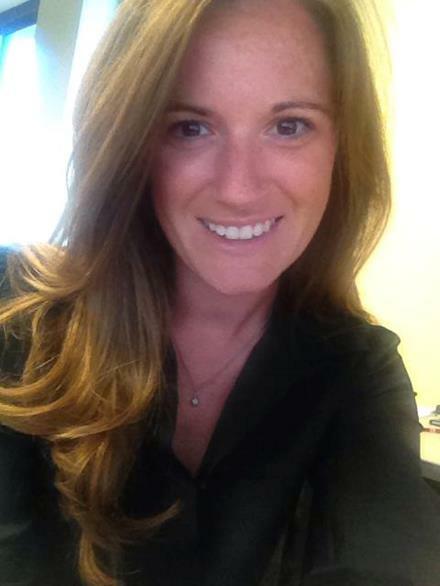 Amanda is the marketing and business development coordinator at Lord Aeck and Sargent (LAS). LAS is an Architecture, Urban Design and Planning firm that focuses on six practice areas: science and technology, higher education, housing and mixed-use, arts and culture, historic preservation and urban and campus planning. Amanda grew up in Longview, Texas and graduated from Pine Tree High School, then attended Texas State University in San Marcos and double majored in English and Mass Communications. She loves photography and joined a photo group that travels all around the hill country taking photos and enjoying adventures. She is also an avid reader, concert goer and hiker and enjoys spending time on the greenbelt. Amanda is looking forward to get to know other people in the AEC industry through SMPS and welcomes the opportunity for networking and professional development through educational resources. 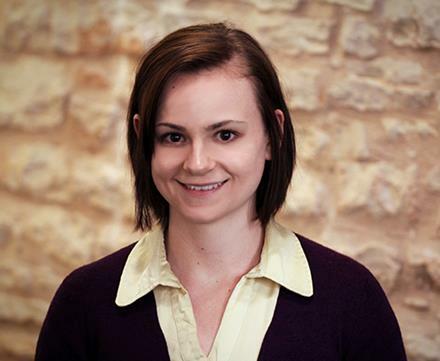 Marisa is the marketing coordinator for American Constructors, Inc., a general contractor and construction management company that has been building innovative, high-quality projects in Central Texas for over 30 years. Marisa is responsible for creating written and electronic marketing collateral and communications, developing RFQ/RFP responses, coordinating the firm's annual charity event and updating and maintaining the company's website. Marisa is originally from Honolulu, Hawaii and moved to Austin in 2006. 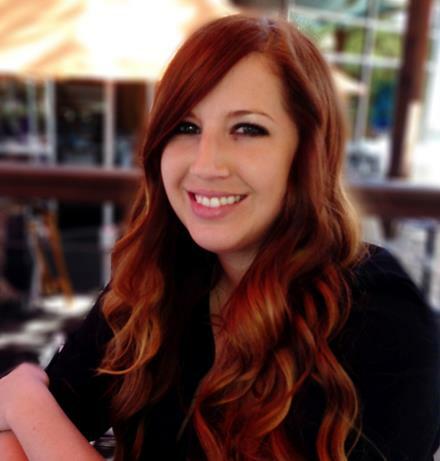 She is a graduate of Texas State University, with a BA in English and an emphasis on professional writing. Marisa spends her free time cooking and entertaining, going to movies (especially at Alamo Drafthouse), reading, trying new restaurants, exploring Austin with her husband, traveling and spending time with family, friends and her two cats. Marisa joined SMPS to expand her marketing knowledge and design skills by connecting with other professionals in the industry, attending meetings and workshops and getting involved with the chapter's committees and events. Chamberlin Roofing and Waterproofing is an established commercial specialty subcontractor that provides roofing and sheet metal, waterproofing and caulking, building and garage restoration services as well as related maintenance and leak repair. Hillary serves as the firm's Marketing Administrator. Hillary grew up in Sweeney, Texas and graduated from Texas State University in 2010. In her free time, Hillary likes to restore and refinish furniture - she finds turning a cheap chair or table into something new and unique very exciting! She also likes to spend time with friends, read, play volleyball and watch football. Hillary recently moved to Austin from Houston and hopes to gain valuable information from the SMPS Austin Chapter by taking advantage of education opportunities. 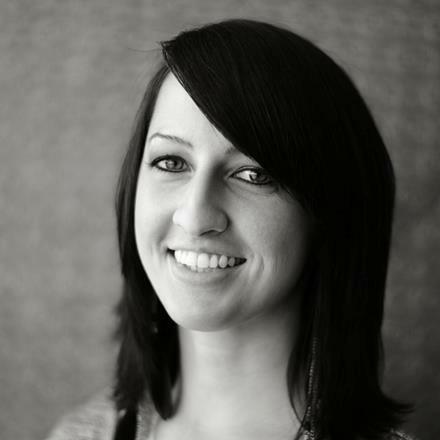 Christin is the Marketing Coordinator for STG Design, which is an architecture, interior design and planning firm. Christin grew up in Tampa, Florida and went to school at Florida State University, having graduated with a BS in Interior Design. Christin is one of two lead singers in a rock and roll cover band, so between gigs and practices, that occupies the majority of her time outside of the office. She also plays in a sand volleyball league and enjoys getting outdoors on a nice day. Christin finds that SMPS is not only a great resource for networking, but also for accessing many different tools and workshops to help marketing professionals grow in their careers. 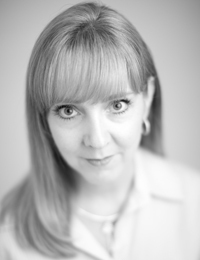 Erin Bettison is now Marketing & Business Development Director at Clayton & Little Architects. 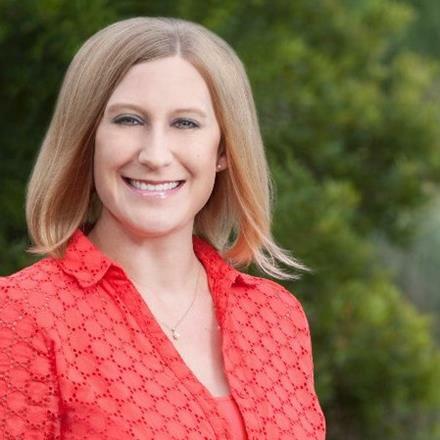 She was previously the Central Texas Marketing Manager at Austin Commercial. Kirk Clennan is now Business Development Manager at Satterfield & Pontikes Construction. He was previously Membership & Economic Development Director at The Greater Austin-San Antonio Corridor Council. 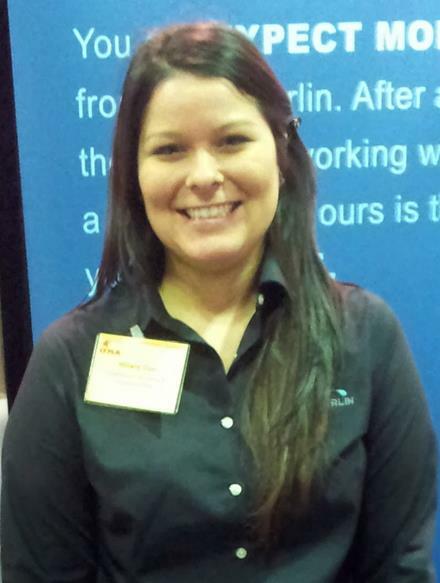 Darla George is now Marketing Coordinator at Alliance Transportation Group. Adam Kohler is now Director of Marketing and Business Development at Sabre Commercial. He was previously Director of Business Development at VRW Construction.